Commentary of the Marengo Battle, won on twenty-five Prairial, year 8 by Napoleon Bonaparte, First Consul, commander in person of the French Reserve Army, against the Austrians, led by Lieutenant-General Mélas; written by General Alexandre Berthier, War Minister, commander under the immediate orders of the First Consul; and accompanied by indicative maps pertaining to the different troop movements, geometrically noted by the geographer-engineers of the General Depository of War, under the direction General Sanson, Engineer Inspector. In-plano, engraved title with starred framing [engraved by Ch. Picquet], 1 f° dedication with starred framing [To the Emperor, written by Berthier, on the Marengo battlefield, 23 Prairial year 13, anniversary of the Battle], - 1 f° with starred framing [Situation of the Reserve Army], 17 pages of text, all printed with a starred framing engraved on copper and 1 blank page, 2 large campaign maps with a double page in two states, engraved with captions, the first representing the territories of Northern Italy, washed watercolor; the second in black with hand-made color highlights ; 4 double pages plates of the Battle of Marengo, numbered I-IV, with color highlights featuring the position of various troop corps with their movements and artillery fire. Rare original edition with an in-plano format, limited edition, printed on Holland, beautifully illustrated with 8 plates engraved on copper by Charles Piquet, engraver and geographer. Intended for the Imperial propaganda, this piece was printed with a careful deluxe typography, including 2 maps and 4 very spectacular double page spread with color highlights, recounting the troop movements to Italy during Year 8. Superb red morocco binding that can be attributed for this period to Charles-Pierre Bizouard, Josephine de Beauharnais’s official bookbinder, who cared for the books from the Bibliothèque de la Malmaison, and Bozerian—well known for the delicacy and unique style of his decorative binding irons. Great Imperial crests, O.H.R. 2652, iron n°10. 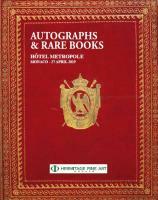 There are 3 printed editions of this book; the first one with a large in-plano format featuring a luxurious red binding, intended for the highest dignitaries of the Empire and for Napoleon’s relatives, and 2 other more common ones, with an in-quarto format bound in green morocco and one in a smaller in-8 format, offered to the generals and officials of the Imperial Régime. It is recognized that only about twenty pieces of this princeps edition were printed. Among the prestigious collections, we can identify the copy belonging to Marshal Suchet (Bibliothèque du Maréchal Berthier), the copy belonging to the Duc de Plaisance (quoted by Brunet) and the one belonging to Napoléon’s Minister of the Navy, Admiral Decrès (Collection Souham). It was published at the same time [as the edition in-4°], a large format edition in-folio with framing around the pages, which was apparently printed in only twenty-five copies. 110fr, red morocco, lace, the Duc de Plaisance [Charles-Francois Lebrun’s sale, Duc de Plaisance, Third Consul and Prince arch-treasurer of the First Empire]. This commissioned Commentary required several years of work and was modified many times until the day before the proclamation of the Empire; the tactical errors were concealed, the retreat movements minimized, as well as the actions of Lannes and Kellermann, but the actions of the consular guards were, on the contrary, highlighted. PROVENANCE. Bibliothèque du Comte d’Orsay, acquired in 1823; with handwritten mention on the front endcover; work originating from the Library of Emperor Napoleon. Sold in Sainte-Hélène, bought by Bos- sange and resold to the Comte d’Orsay. Works originating directly from the Emperor’s library in Saint-Hélène are very rare. Although our copy is not marked with the distinct stamp of the Longwood Library, it was nonetheless spotted by bookseller Bossange, who took was in charge of selling the works originating from the Library of Sainte-Hélène. When Napoleon died in 1821, his Library in Longwood comprised around 3,500 books. These were broken in two categories: on the one hand, the books shipped to France in 1815, originating from imperial legacies, mainly from the Bibliothèque de Trianon and on the other hand, books acquired afterwards and sent to England between 1816 and 1821. Former page at the court of Napoleon, Alfred d’Orsay (1801-1852), was one the main financial backers and friend of Louis-Napoléon Bonaparte, especially during his failed attempt of Boulogne and after his escape from Fort Ham, by welcoming him when he went into exile in London. The Comte d’Orsay was known for his dandism, living between London and Paris and interacting with the social elite of the time, Thomas Lawrence, Disraeli, Dickens, Byron, Vigny, Lamartine, George Sand... and Louis-Napoléon Bonaparte. A race horse enthusiast, perfume creator, recognized painter and sculptor, the Comte d’Orsay, married the daughter of a rich heir but lived with his mother-in-law, Lady Blessington. Alexandre BERTHIER, prince de Wagram et de Neuchâtel, maréchal de France. A Paris, Au Dépôt Général de la Guerre, an XII. [1804 (édité en 1806)]. In-plano, titre gravé avec encadrement étoilé [gravé par Ch. Picquet], 1 f° de dédicace avec encadrement étoilé [A l’Empereur, rédigée par Berthier sur le champ de Marengo le 23 Prairial an 13, anniversaire de la Bataille], -1 f° avec encadrement étoilé [Situation de l’Armée de réserve], 17 pages de texte toutes imprimées avec encadrement étoilé gravé sur cuivre et 1 page en blanc, 2 grandes Cartes générales de la campagne à double page en deux états, gravées avec légendes, la première représentant les territoires du Nord de l’Italie aquarellés au lavis ; la seconde en noir avec rehauts de couleurs à la main ; 4 planches à double page de la bataille de Marengo, chiffrées I-IV, avec rehauts en couleurs figurant la position des différents corps de troupes avec leurs mouvements et les tirs d’artillerie. Plein maroquin rouge à grains longs, dos lisse orné de vasques et fleurons alternés de larges frises dorées, avec titre doré, les plats richement ornés de 6 encadrements successifs de frise à la grecque, dentelles ornées, guirlandes, roulettes et chainettes dorées, grandes armoiries impériales aux centres, roulette dorée sur les coupes et chasses, bordure intérieure avec guirlande dorée, toutes tranches dorées, doublure et gardes de tabis bleu, ex-libris de basane rouge au coin sup., 2 feuillets de gardes en début et fin d’ouvrage (reliure de l’époque). Splendide exemplaire comportant de menus défauts (mors et coiffes frottés, dorures du dos légèrement estampées, petites usures aux coins, traces de restauration).